I started this Grandmother’s Flower Garden in 2009 when I belonged to a miniature quilt group. In an effort to finish all my UFOs (UnFinished Objects), I have once again dug this quilt out. I immediately decided that I needed to add on some more hexies. Or did I? I guess I could have left it as is, but I keep stewing about how to finish this project and how to quilt it. 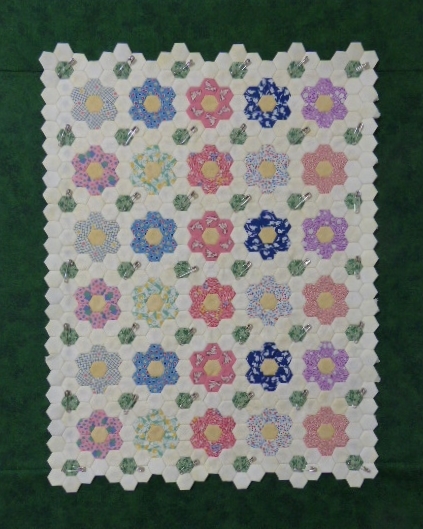 One method would be to quilt 1/4-inch inside the hexies but each hexie is 1/2-inch across, measuring from one flat side across to the other. How did I come up with this size? When I was a stay-at-home mom, I always sent for free things and one of them was this cool template from Crayola. Last week, after once again tracing the wrong size, I finally dummied up and marked the two sizes I was using. Use a permanent Sharpie marker–you can always remove the marks with alcohol, the kind you rub not the kind you drink. 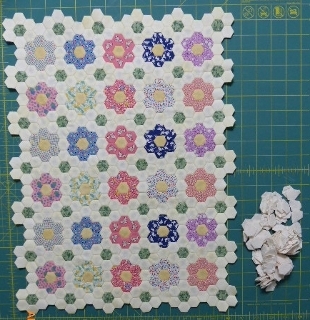 In traditional English paper piecing, you baste your fabric to the paper hexie, hand sew the hexies together, and remove the basting and papers later. 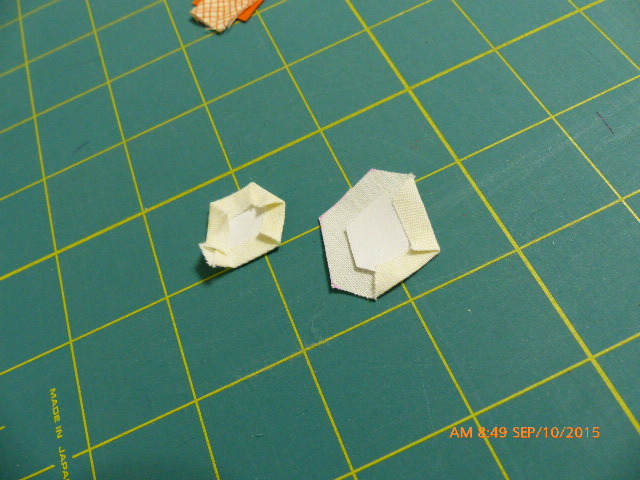 Being these were so tiny, I decided to trace freezer paper templates on the dull side and iron the fabric to the freezer paper. Note that you place the freezer paper shiny side up on the wrong side of the fabric. By the time you get to the last side, there is no shiny freezer paper left–just iron a crease anyway and sew that side first when attaching your hexies. I started using an off-white fabric for the background but after preparing 112 hexies I realized I would not have enough fabric. At one point I was going to use these to face the edge of this project on the back but decided that was just way too crazy, even for me. I wish I had a dollar for everyone who told me I was crazy when they saw this project. To me it’s just another piece of handwork that I enjoy. So where was I? I would have used the same 30’s repro green for the borders but there wasn’t enough left and I didn’t really like anything else. The blue duck print was directional. 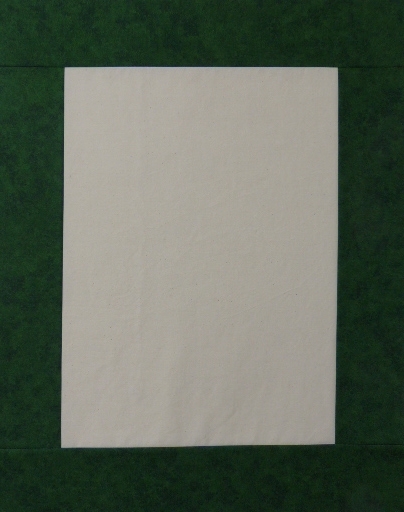 Luckily our modern quilt guild had a little fundraising sale of donated fabric and I found a tone-on-tone green that I thought would set the whole thing off nicely. 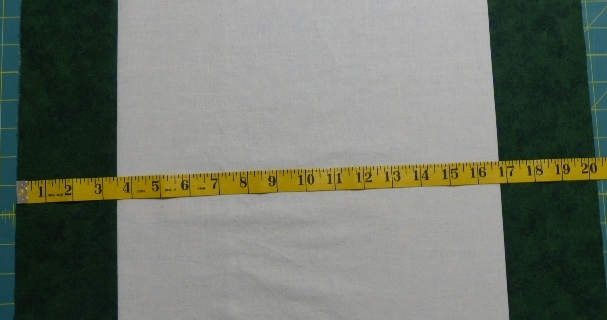 I barely squeezed out the borders as it was barely 16-inches across of useable fabric. After doing some measuring, I decided to make a background to stitch on. Here’s a little tutorial for adding borders. I added the long borders first. I used to measure to find the center of my top and border strips but after making addition errors, I now just fold each piece in half. 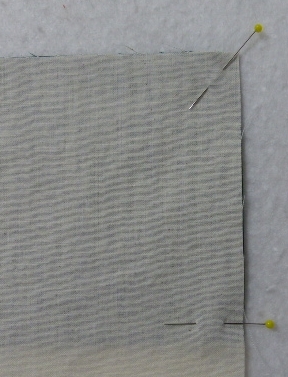 Next bring the end of your strip to the center and place a pin there. Do this as many times as you need, depending on the length, and then match the pins in the border and the center. I also add an extra pin to keep the border even with the center. Sew with the border on the bottom. Next, you need to find out how long to cut the top and bottom borders–measure through the center and cut two strips and sew those on. 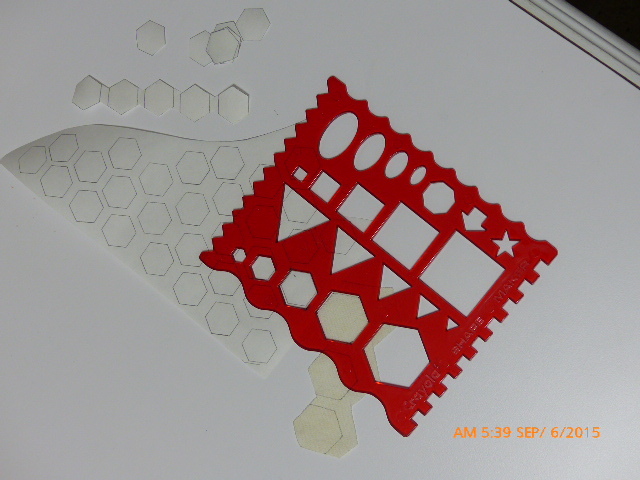 As it turns out, I measured quite accurately and the seam on the hexie project matches the seam on the background piece. As we say in golf, it’s better to be lucky than good. 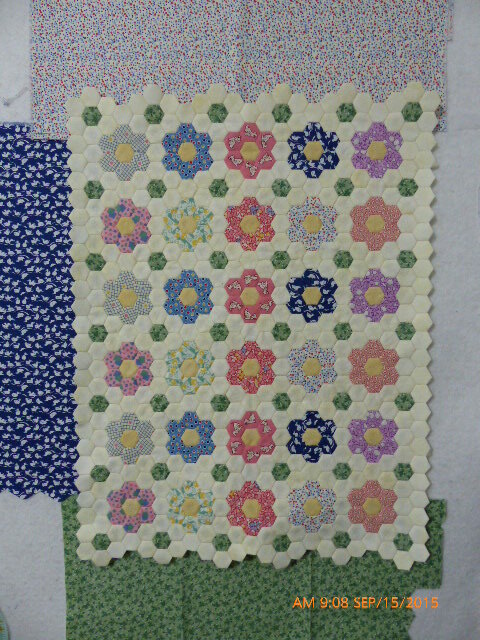 I took the hexies outside and spray basted the back and placed it on the background, pinning the corners. 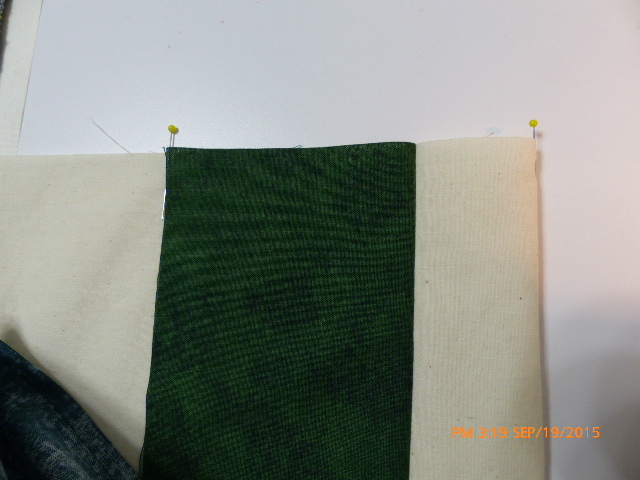 Then I pinned the short sides, the long sides, and through the green centers to hold everything in place. Here’s a tip for your box of curved safety pins–don’t close them when you take them out of a project. If they come out in a clump next time you use them, just drop them in the box lid and they will fall apart. So now I’m ready to hand stitch the edges. 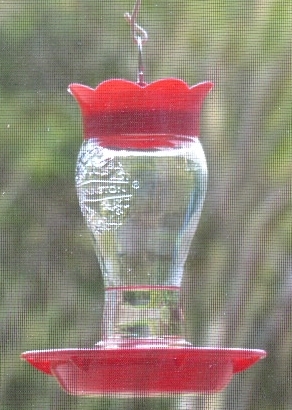 I got some really fuzzy photos of our sweet little hummers–shooting through a screen presents difficulties. Here’s our new feeder–we had SWARMS of honey bees on our old feeder this year. Honey bees, good for the food chain, not so good for the hummers and us. This is a bee/wasp resistant feeder and it works. I have made one last batch of nectar. Don’t worry that you will feed hummingbirds too long–they know when to go south. Keep your nectar out a couple weeks after they leave–you just might catch some transients–ours go to South America and Mexico. Hasta la vista, babies.